Pauline Probst of the Support Project of the Implementation of the Paris Agreement (SPA) introduces the SDG Climate Action Nexus tool (SCAN Tool), which looks at linking climate action and the Sustainable Development Goals, and therefore the links between SDGs and NDCs. In 2015, leaders from the member states of the United Nations agreed on objectives to shift all economies and societies toward sustainable and decarbonised development through the adoption of the Agenda 2030 on the Sustainable Development Goals (SDGs) and the Paris Agreement on limiting global warming to well below 2ᵒC. Both frameworks interlink in such way that, if approached in the right way, climate and sustainable development actions can mutually reinforce each other. Likewise, failure in one process could undermine the success of the other.,. Looking at it in this way, policy makers should pursue implementation of these agendas in a way that can allow to also maximise mutual benefits, understanding potential synergies and trade-offs between them to enable coherent policy planning and increasing implementation efficiency, in particular when considering limited institutional capacities. The SDG Climate Action Nexus tool (hereafter referred to as the ‘SCAN-tool’) was developed under the umbrella of the NDC Support Cluster, as a collaboration between the “Ambition to Action” project, and the “Support for the Implementation of the Paris Agreement” project. 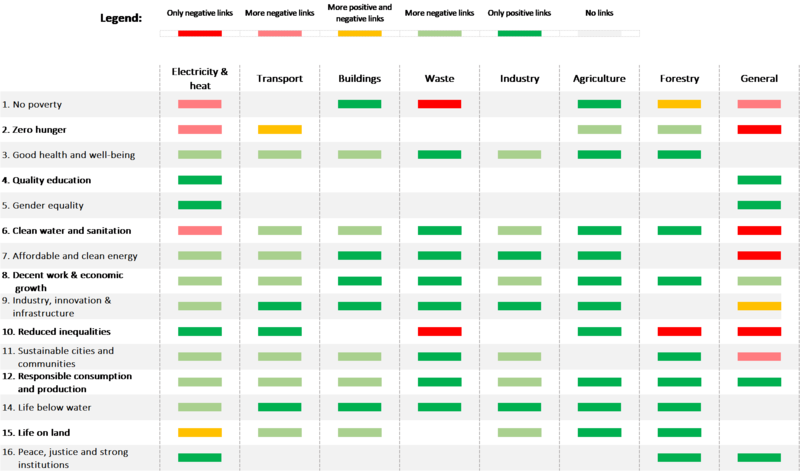 The SCAN-tool was developed to support policy makers across different departments and state levels, to identify and understand which climate mitigation actions may impact -positively or negatively- specific SDG targets. The SCAN-tool can support countries in presenting more ambitious NDC targets -required by the Paris Agreement-, as a better understanding of how climate action can reinforce national sustainable development targets will improve political buy-in. Moreover, the tool may be helpful for a broader set of stakeholders, including the international support community and civil society, to better formulate their engagement strategies. The SCAN-tool covers actions across seven mitigation sectors: electricity and heat, transport, buildings, industry, waste, agriculture, and forestry. The tool collects data from several studies on the nexus between climate mitigation action and specific development areas. The links between the two agendas are classified as either a ‘synergy’, where the mitigation action is likely to reinforce the achievement of the SDG target; or a ‘trade-off’, where there may be a potential conflict between the action and achieving the SDG target. An interactive online version of the tool is available at http://ambitiontoaction.net/scan_tool/. To get a summary of the findings of the SCAN-tool, learn about the methodology for its development and access the database behind it, go to the ‘Resources’ section of the website. A similar analysis to scan links between adaptation actions and the SDGs was carried out and is available for download under the same section. Given differences in sector classifications and intervention types, mitigation and adaptation perspectives were not combined into one tool. 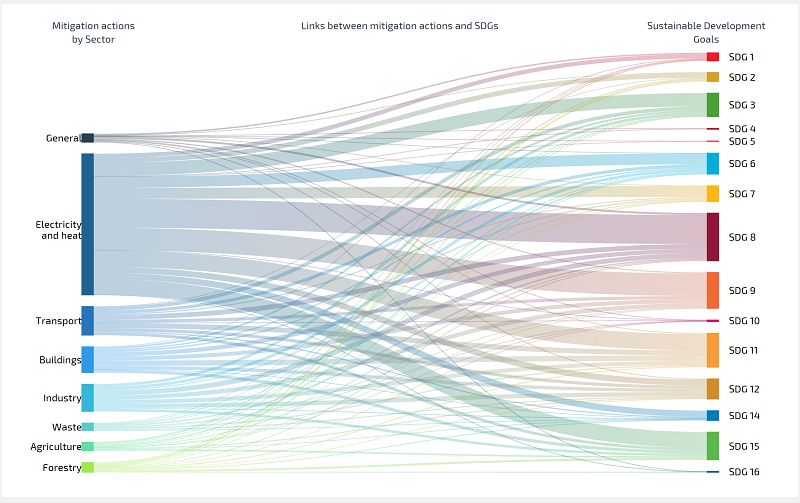 In total, 916 linkages were identified between sector-specific mitigation actions and the SDG targets. This highlights the opportunity and need to approach implementation in an integrated manner. As shown by the width of the lines in the figure below, some SDGs show significantly more links to the different mitigation actions of each sector. Where few linkages have been identified, this can generally be attributed to the transversal nature of the SDG. For example, SDGs related to education or gender equality are difficult to attribute to individual sectors but are relevant to consider across all sectors when designing or implementing mitigation actions. Note: Links to SDG 13 are not listed as we assume linkages between climate actions and other development areas are implicitly represented in the assessed sectoral mitigation actions. SDG 17 is not included in the analysis as it is not a development area comparable to the other SDGs (focuses on mobilization of international resources to achieve SDGs). Comprising a total of 167 targets under 17 goals, the SDG agenda in itself is extensive and complex. In many cases the targets overlap, complicating the attribution of linkages to individual subsectors and mitigation actions. To address this complexity and inter-relatedness, the SCAN-tool focusses on identifying primary impacts rather than secondary impacts that may also occur as a result. As can be seen in the summary table below, the number of synergies outweighs the trade-offs found for all of the SDGs. In fact, 76% of linkages identified in the tool are positive. The table also shows that there are interactions between sector specific mitigation actions and most of the SDGs, suggesting a high potential for tackling both agendas simultaneously at the action level. Figure 2: Summary table showing types of links between each mitigation sectors and the SDGs. In addition to the impacts a mitigation action may have on the SDGs, the types of interventions used by government to stimulate those mitigation actions can also impact the achievement of the SDGs. The choice of policy instrument (e.g. taxes on liquid fossil fuels; innovation / demonstration programmes) can determine whether these actions can support or undermine the achievement of the SDG and its associated targets. This should be carefully considered when selecting and designing policies and intervention strategies. Finally, many or perhaps all of the linkages are very context specific. The precise conditions in a country or region may mean that a linkage that is very important in one location could be far less important in another. The SCAN-tool provides users with an initial, high-level ‘scan’ of the links between mitigation actions and the SDGs. It is a first step in a journey that policy makers at the national and sectoral levels will need to take to maximize sustainable development benefits while minimising trade-offs as they design and implement mitigation activities. A country-specific analysis will be necessary to fully understand the linkages and to provide robust information on their magnitude, before countries can exploit synergies and manage potential trade-offs in a comprehensive way. The tool was developed together with the NewClimate Institute, within the “NDC Support Cluster” of the German Federal Environment Ministry (BMU). Read more about the SCAN-Tool findings. Image (above, right): Integrated sustainable development actions in the green belt of Quito, Ecuador (CDKN).